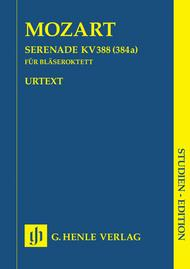 Serenade in C minor K388 (384a) (Study Score). Composed by Wolfgang Amadeus Mozart (1756-1791). Edited by Henrik Wiese. For Clarinet, French Horn, Oboe. STUDY EDITION. Henle Study Scores. Pages: VI and 54. Softcover. 60 pages. G. Henle #HN9797. Published by G. Henle (HL.51489797).For 2 oboes, 2 clarinets (Bb), 2 horns, and 2 bassoons. Horn parts in Eb and F.“I've had to turn out a serenade on short order”: these lines from Mozart to his father offer a glimpse into the everyday life of a composer dependent on patronage. Mozart was about to be married when he pulled this wind piece out of his hat. Yet the results are far removed from the detached, courtly style of the serenade: the work, one of the jewels of the wind repertoire, opens full of earnestness and profundity in the gloomy key of C minor. The high opinion Mozart had of this octet is evident in the fact that he later arranged it for string quintet.